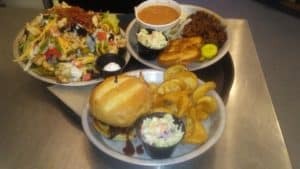 Pigeon River Grille (PRG) is a Southern-inspired restaurant serving simply prepared, fresh food sourced from top purveyors, offering diners a vibrant combination of flavors. PRG is located at BearWaters Brewing in Canton. Menu offers a variety such as shrimp po boy, pork skins, carolina reaper wings and more. Pet friend indoor and outdoor seating.